NO SCHOOL = NO LUNCH. Santa Barbara County children receiving free or reduced-priced lunches during the school year may go hungry in the summer. 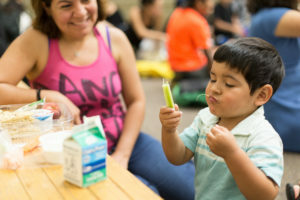 Your donation funds our Picnic in the Park program, which provides over 36,000 free nutritious lunches and enrichment activities for children and their families all around the county. VOLUNTEER TO HELP SERVE LUNCHES! This entry was posted on March 17, 2017 by Judith Smith-Meyer.